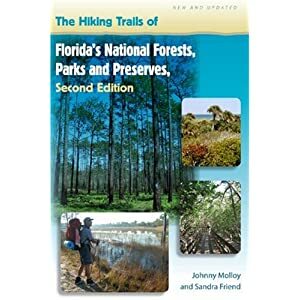 This book covers hiking destinations throughout the Sunshine State, from the Panhandle to the Everglades. Truly a comprehensive book. And as more and more transplants move to Florida from other states, they are bringing their passion for hiking with them. Once here, they find surprisingly ample outlets for their feet and pass on the word about just how good hiking in Florida can be. So what makes hiking here so appealing? A unique hiking environment — most of Florida stretches along a peninsula that juts southward into Atlantic Ocean and Gulf of Mexico. This southward direction and being situated between these bodies of water helps result in Florida having flora unlike other hiking areas in the United States. Where else in U.S. mainland can you walk beneath palms or tread through a tropical hardwood hammock? Florida has a long hiking season and is ideal for walking during times when it can be unpleasant elsewhere. The lower part of the peninsula, in such areas as Everglades National Park, the drier, cooler weather, is during winter and early spring. In central Florida, the hiking season extends from late fall through early spring. Finally, moving north, hikers can comfortably enjoy the trails from fall through spring. Trailhead: From the Osceola Ranger Station, 12 miles east on Lake City on US 90, keep east on US 90 for 3.2 miles past the ranger station to the Olustee Battlefield. Turn left into the battlefield area and turn left again into a parking area just past the railroad tracks on your left. This section of the Florida Trail is well marked, groomed and maintained. Formerly known as the Osceola Trail, it starts out at the site of Florida’s largest Civil War battlefield and heads into attractive pine flatwoods, passing occasional cypress depressions. It then keeps north and west, eventually coming to a welcome trail shelter on the banks of a waterway. This section of the Florida Trail ends shortly after the shelter, at the Turkey Run trailhead. Today, the Florida Trail winds beneath tall longleaf pines with a mown grassy understory. This spot, first memorialized in 1913 by the Florida legislature, is used for the battle reenactment held every February. Beyond the battlefield site, palmetto grows under the longleafs and the FT shares treadway with the Nice Wander Loop, a nature trail. Pass through a clearing and a wet area overlain with boardwalks then reach Forest Road 208 at 1.0 mile. Turn left on Forest Road 208 and follow it for .4 mile — the Florida Trail then reenters the woods on road right. The forest here is young and offers less shade. Keep northwesterly through pine, bay and palmetto woods, soon coming to Forest Road 268, which also leads to Ocean Pond Campground. Keep forward and cross a long boardwalk over a cypress head. There are numerous bay trees in this area. Emerge onto Forest Road 241 at mile 6.2. Turn right along the forest road to County Road 250A. Turn left here and walk over the paved road to cross I-10, where the cars below are moving startlingly fast. Leave the high speed world behind at the bottom of the bridge and dive left into the woods at mile 6.8. Soon cross Forest Road 263B and begin a long stretch of open flatwoods. Come to a pine plantation at mile 7.7, and wind among the dense rows of shade bearing evergreens, emerging onto County Road 250A at mile 8.2. While crossing the road, you also bridge a creek below you. Pass through an ATV-proof gate and parallel the stream, soon turning away from the water and resuming a westerly course through pine flatwoods. Watch for a pond off to your left at mile 8.6. Keep northwest, coming to a footbridge over a creek and turn sharply right. Dead ahead is a trail shelter, at mile 9.3. This shelter has wood board floor, is open on all sides, and is covered with a tin roof supported by beams at the corners. A metal fire grate is nearby. Water can be obtained from the creek below and a vault toilet lies a short distance away. To continue on the Florida Trail, backtrack just a short distance, and continue northwesterly. The trail bisects a timber cut then pine plantations, crossing another stream. Emerge onto County Road 250 and the Turkey Run trailhead at 9.7 miles. It is 11.4 miles west on the Florida Trail to Deep Creek trailhead and the end of the FT through the Osceola National Forest.